One Mind, One Heart is the response of the Heiltsuk Nation to the proposed Northern Gateway pipeline and to oil tanker traffic in their territories. 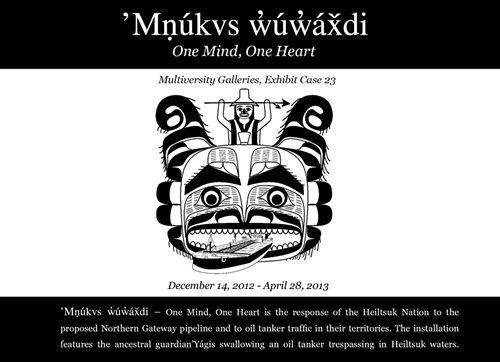 The exhibit features the ancestral guardian ’Yágis swallowing an oil tanker trespassing in Heiltsuk waters. ’Yágis, the mask was created by ’Nusí, Heiltsuk artist and embodies the ancient teachings of the Heiltsuk to protect their land and seas against such perils as pipelines and oil tanker traffic in their waters. It also includes an iPad kiosk featuring films, photos of Heiltsuk territory, and community members protesting during the Joint Review Panel’s visit to Bella Bella. The installation was curated by Pam Brown, MOA curator in collaboration with the Heiltsuk Nation and ’Nusí, Ian Reid, Heiltsuk artist and activist.